Special Teams, Will It Once Again Decide The Iron Bowl? Alabama is the top ranked team in the country, but Auburn comes in at 6th. Auburn has a shot play spoiler and even potentially get in the college playoffs. Alabama is shooting to stay undefeated and also in-line for a playoff bid. The stakes couldn’t be higher for both teams. In games like this, it can come down to a game of inches and one where special teams can play a huge part. Alabama fans love to talk more about Van Tiffin’s kick in the final seconds of the 1985 Iron Bowl, while Auburn fans relish in 2013’s Kick Six that was one of the worst special teams blunders of all time. Alabama attempted to kick a 57 yard field goal with a kicker, Adam Griffith, who had no experience kicking such a long field goal. It ended in disaster for Alabama as Chris Davis of Auburn returned the field goal kick 109 (100 officially) yards to prevent Alabama from chasing it’s 3rd national championship in a row. Both Alabama and Auburn feature top special teams players in the country. Alabama has arguably the best punter in the country in JK Scott, while Auburn has one of the best placekickers in the country, Daniel Carlson. Both players are finalists for the top special teams awards in the country, the Ray Guy Award and Lou Groza Award. JK Scott has the ability to flip the field and pin teams deep in their territory. 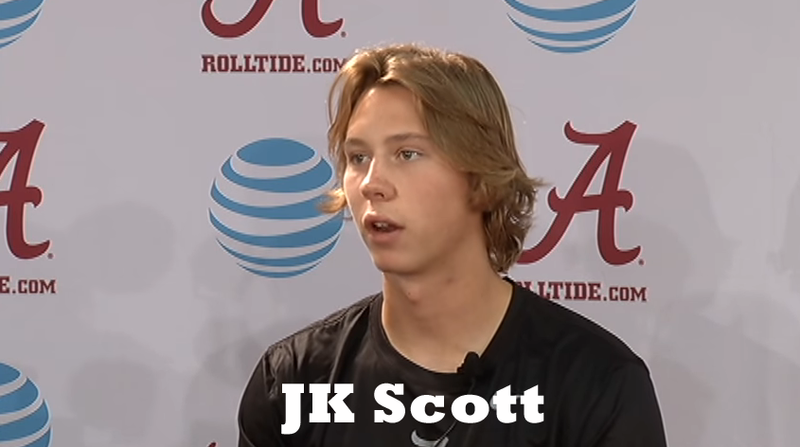 JK Scott places 55% of his punts inside the 20 yard line while also having a 43 yard average. Booming punts make it so much easier for the Alabama defense to defend opposing teams that are pinned deep. Ranking #1 in fair catches and #2 in the country, Scott’s kicks are so high that the opposing team has a hard time making any returns. Just two weeks ago, Alabama’s Andy Pappanastos go-ahead field goal kick bounced off a goal post against Mississippi State. Bama was able to regroup and rally for a TD after that, but it is something that certainly makes Bama fans nervous once again going into the Iron Bowl. Auburn’s Carlson is second in NCAA history in 50+ field goals over his career. He is accurate and able to make opponents pay on long field goals. Bama has to keep Auburn pinned in their own territory or it could turn out bad for Alabama in a tight game. Whatever happens today…special teams are bound to make a difference in today’s special Iron Bowl. That is something you can count on!